Stocks of Canadian cannabis producers and sellers are on a wild run in 2018. A selection of talked about names have doubled or tripled in value the past few months, with others not far behind. Price action like that is bound to pique the interest of investors and traders who may be wondering what has caused the surge in prices, something that is looked at in the first part of this article. Other investors and traders already familiar with the space may be questioning the valuation of major names, which is a second major focus of this article. The final focus of this article is to provide a precautionary tale and some tips for anyone looking to get exposure, long or short. 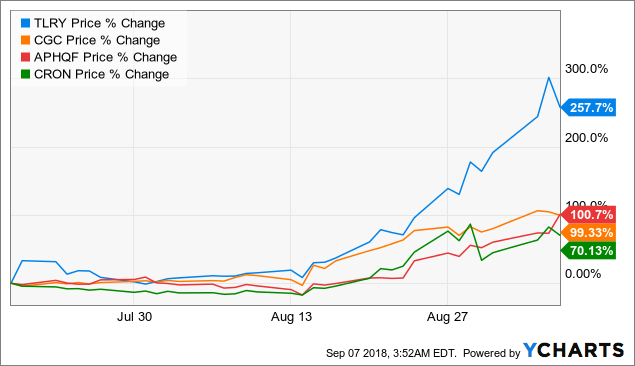 Figure 1: Performance of four Canadian cannabis producers since mid-July (IPO of TLRY): Cronos Group Inc (CRON), Aphria Inc (OTCQB:APHQF), Canopy Growth Corporation (CGC) and Tilray Inc (TLRY). The recent run up in Canadian pot stocks comes off the back of announcements that major beverage makers had either made or were looking to make investments in Canadian pot stocks. However, such investments would likely not materialize were it not for legislative developments and so we might argue that the passing of new laws is what is truly responsible for the run up. A landmark event for the space occurred on June 19, 2018, when the Canadian senate voted to approve bill C-45 (The Cannabis Act), which received Royal Assent on June 21, effectively legalizing recreational use of marijuana from October 17, 2018. Those over 18 will be able to purchase cannabis products from a provincially/territorially regulated retailer (or from a federally licensed producer), carry and share (with other adults) up to 30 grams, and cultivate up to four plants in their homes. Royal Assent for the bill was actually met with a sell the news reaction by some Canadian pot stocks, which was likely due to the fact that approval of bill C-45 was largely expected and some names had already begun to run up approaching the news. The approval however, did clear the way for a number of deals. A recent major deal was announced on August 1, when Molson Coors Canada, the Canadian arm of Molson Coors Brewing Company (TAP) notified investors it had entered into an agreement with The Hydropothecary Corporation (HYYDF, TSX: HEXO) to form a joint venture which would develop cannabis-infused beverages. The initial reaction from HYYDF was pretty modest, perhaps because the press release noting the deal didn’t provide a lot of detail on the potential financial benefit to HYYDF. Supposedly some warrants would be issued and purchased, but how much would this bring in for HYYDF was not clear. In connection with the closing of the transaction, subject to the final approval of the Toronto Stock Exchange, HEXO will issue to Molson Coors Canada warrants to purchase shares of HEXO. – Comments from August 1, 2018, press release from TAP and HYYDF. The next deal announcement in the Canadian Cannabis space had a much higher impact, perhaps due to clarity on the financial benefit to the cannabis producer involved. On August 15, Constellation Brands (STZ), a Fortune 500 alcohol beverage company, announced it would increase its stake in CGC by acquiring 104.5 million shares at $48.60 CAD (a 51% premium to the close the day prior to the press release). The deal will increase STZ’s holdings in CGC to approximately 38 percent of shares outstanding (assuming certain existing warrants are exercised, the PR suggests this is the case). As part of the deal STZ will also receive additional warrants which, if exercised, would give STZ greater than 50 percent ownership of CGC. Figure 2: STZ lays out the addressable market in Canada, 15 years from now. Source: STZ investor overview presentation. The STZ-CGC deal fueled additional speculation: Which beverage giant would strike a deal with which cannabis company next? August 24 saw a report from BNN Bloomberg noting Diageo Plc (DEO) was holding discussions with three or more Canadian cannabis producers. The speculation continued when on August 28, The Globe and Mail published an article noting multiple beverage makers including Anheuser-Busch InBev SA/NV (BUD), Pernod Ricard SA (PDRDF, PDRDY), Heineken Holding NV (OTCQX:HEINY), The Coca-Cola Company (KO) and DEO were making the rounds with cannabis producers. Investors and traders might believe now is the time to go long one or more Canadian pot stocks before one of these beverage makers decides to make a move, but with such a run up already, it makes sense to consider the valuation of some of the key names in the space. Lets look at the market cap of just the four names shown in Figure 1 and Aurora Cannabis Inc (OTCQX:ACBFF). We will start with CGC. Seeking Alpha’s Julian Lin notes due to shares being issued for STZ to buy from CGC, the number of shares outstanding has increased substantially, something some do not appear to be taking into account, and other analysts are trying to get clarification on. And then, one more housekeeping and I’m sorry to because it wasn’t clear in the release. So I’m trying to calculate the fully diluted number of shares now… – Andrea Teixeira, JP Morgan. So let me while Tim digs up the share count. – Bruce Linton, Co-Founder, Chairman & CEO of CGC, August 15, 2018, earnings call. You know it’s bad when someone has to “dig up” the share count (maybe go easy on issuing so many shares?). Tim [Saunders, the EVP and CFO of CGC] did come up with a number of 268M fully diluted shares outstanding prior to the STZ deal. Still we can go ahead and add 104.5M shares to that for STZ and the additional warrants that were granted (139.7M) to come up with a fully diluted count of 512.2M shares. Now how many of those are outstanding now? Well, I don’t think the 139.7M which could come from the exercise of those warrants are in play just now given their conditions (88.5M are exercisable at $50.40 CAD and 51.3M are exercisable at the volume-weighted average price at the time of exercise). However the warrants and options which led to the 268M count have more favorable terms and so one can’t pretend they represent potential dilution that probably won’t happen, they are in the money (heavily) and need to be included in any market cap calculation. For example as of June 30, 2018, there were 18,969,495 options outstanding as part of an employee stock option plan exerciseable at prices between $0.56 and $40.51. Similarly as of June 30 their were 18,876,901 warrants outstanding with exercise of $12.97 (these are the original STZ-held warrants which were to be exercised to get STZ to 38 percent stake in CGC). Those options and warrants account for most of the 268M fully diluted number noted on the August 15 earnings call and so I’m adding 268M to 104.5M (total 372.5M) for my market cap calculation. At the close of $51.53 on Friday September 7, that yields a market cap for CGC of $19.19B. TLRY‘s 10-Q notes 93,144,042 shares outstanding as of August 29. As of August 29, 2018, the registrant had 16,666,667 shares of Class 1 Common Stock… and 76,477,375 shares of Class 2 Common Stock… – Comments from TLRY 10-Q. Class 1 and Class 2 shares have different voting rights. At Friday’s close of $77.89, TLRY’s market cap was $7.25B. APHQF notes 232,372,569 shares outstanding in a recent investor presentation, that yields a market cap of $3.6B based on Friday’s close of $15.49. Table 1: Shares, options and warrants outstanding for APHQF. Source: Recent investor presentation. Isn’t it great when the number of options grows overnight? Below is the same table based on July 31, rather than August 1. If one wanted it would be possible to use the 238M number which adds in the exerciseable and in the money options and warrants to get a partially diluted market cap like I did for CGC (funny that APHQF refers to this as fully diluted). Table 2: Shares, options and warrants outstanding for APHQF on July 31. Source: 2018 annual report. CRON had 177,147,970 shares outstanding on August 14 corresponding to a market cap of $2.12B based on Friday’s close of $11.99. Table 3: Shares, options and warrants outstanding for CRON. Source: Exhibit 99.2 from August 14, 2018, 6-K filing. ACBFF noted 564,783,420 shares outstanding on May 7, 2018. Table 4: Shares, options and warrants outstanding for ACBFF. Source: Q3 FY ’18 results. However ACBFF acquired MedReleaf Corp shortly following Q3 FY ’18 earnings in an all share deal worth $3.2B. MedReleaf shareholders were to receive 3.575 shares of ACBFF per share of MedReleaf. The exchange ratio implied a price of $29.44 CAD per share of MedReleaf suggesting ~109M shares were being acquired. That calculation agrees with the number of outstanding shares, warrants and options of MedReleaf around the time of the acquisition (Table 5) and suggests ~390M shares of ACBFF were used to make the acquisition. Table 5: Shares options and warrants outstanding for MedReleaf. Source: MD&A dated June 18, 2018. 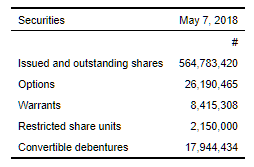 So go ahead and add that ~390M used to acquire MedReleaf to the 564.8M shares outstanding on May 8, that gets us to ~955M shares outstanding, which agrees with Bloomberg’s 951.41 M (I’d say the 109M is a little high and because of the 3.575-to-1, being off by 1M on MedReleaf means being off by 3.575M on ACBFF). I’ll use the Bloomberg number to be conservative, but know that many of the options and warrants listed in table 4 may have been exercised by the time we get the next update from ACBFF (likely next month) and so a shares outstanding count of over 960M should not be a surprise. Thus at Friday’s close of $6.17 ACBFF had a market cap of $5.87B. Now if we add up the market cap of just these five names, we get to $38B. 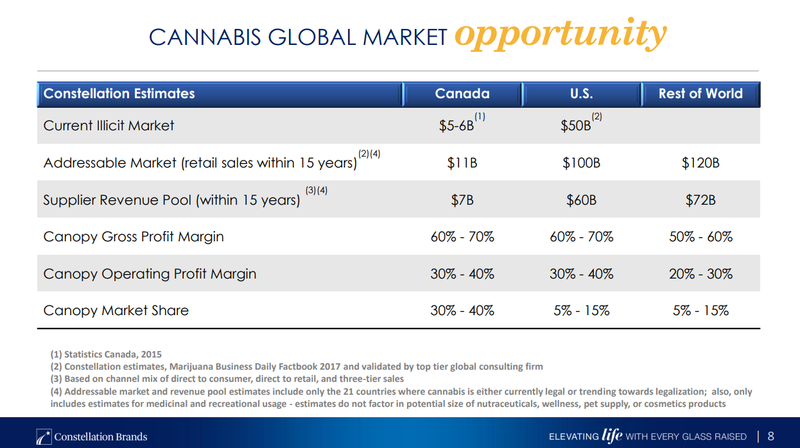 Above in Figure 2, STZ notes Canadian sales estimates of $11B. 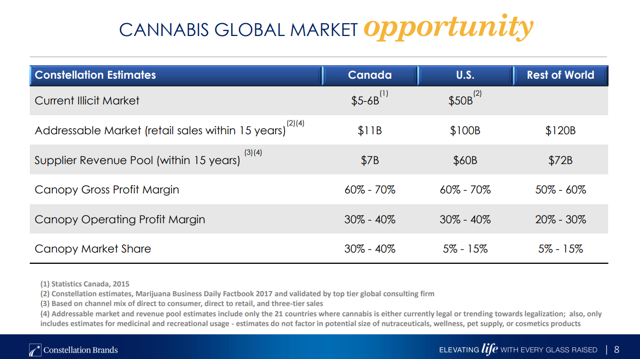 So these five pot stocks together trade at 3.5 x Canadian sales estimates (sounds good)… sales estimates for around 2032 that is (oh)… based on sales at the retail level (not good). The actual Canadian supplier revenue pool is estimated at $7B and that yields a multiple of 5.4 (again, 15 years from now in 2032). We can also look at sales estimates of $4.9B in 2022 for Canada from another source and that would have these five companies together trading at a multiple of 7.8 x 2022 sales. That may sound a little more encouraging but there are not just five Canadian pot stocks and the share count of these companies seems to grow overnight (meaning the market cap will grow unless the price comes down). Investors may have read that Canada has restrictive conditions with regards to obtaining a licence to produce and supply cannabis products. There are however, already 116 licensed producers of cannabis for medical purposes in Canada, up from just six at the end of 2013. For more color, Nova Scotia Liquor Corporation placed purchase orders with 14 cannabis vendors in August, so there is already plenty of competition. If we were to add up the market cap of those 14 companies, the valuation would look even more stretched. To justify current valuations, Canadian cannabis producers would need to tap into the worldwide market to quite an extent. However, where ever cannabis is legalized, an industry seems to pop up around it, we saw this already in state after state in the USA. On the other hand, in Uruguay there are actually only a two licensed producers. Prime opportunity for Canadian cannabis producers to capture, you suggest? Not really, the government has set the price at $2.50 a gram (and the population of Uruguay is about 3.5M making it a much smaller market). Compare that to estimated Canadian sale prices of closer to $10 CAD and the profit margins in Uruguay seem barely worth it (you’d have to ship the product a bit further too). When you can produce something domestically, do you really need to import it? Is Canada really the cheapest most efficient place in the world to grow Cannabis? Or does growing cannabis require a whole lot of lighting, heating (especially in colder climates), pumps and fans? Consider the cost of electricity in Canada compared to elsewhere in the world. Does Canada pay workers the lowest wages in the world, making it a cheaper place to produce cannabis? Or is the rising minimum wage in Canada actually threatening job numbers there? Canadian cannabis producers do have or are setting up warehouses elsewhere, but as countries legalize cannabis, legislation to make sure the industry creates money for the country/state concerned and not some other nation (Canada) doesn’t seem unlikely. I just don’t see why a lot of the world’s cannabis won’t end up being grown domestically or produced in the developing world at lower costs. In late 2012, 2013 and 2014 pot stocks, mostly US based saw similarly remarkable price action to what is being seen now with Canadian pot stocks. Washington state legalized possession of up to one ounce of marijuana in late 2012 for those 21 or older, Colorado soon followed suit. Some of the pot stocks caught up in the hype were legitimate names (that doesn’t mean their ridiculous valuations persisted) and others were a little more scandalous. 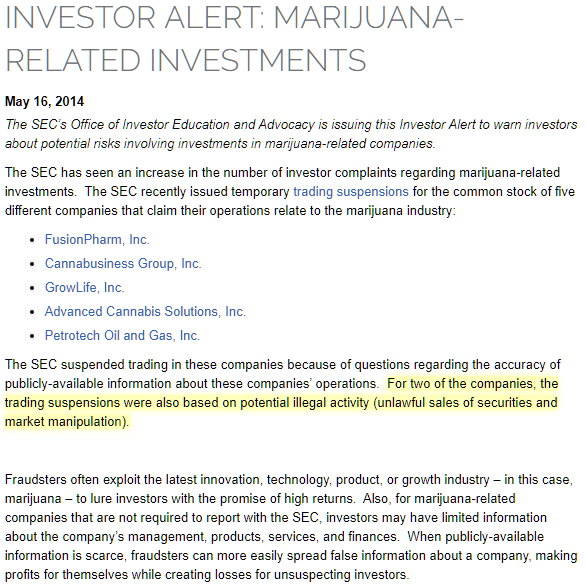 Figure 3: Screen capture of 2014 warning about pot stocks. Highlights by Biotech Beast. Source: SEC website. So what happened to those names? Well Fusion Pharm Inc (OTC:FSPM) is down from highs over $9 in 2014 to $0.02. Cannabusiness Group Inc (OTC:CBGI) is down over 90 percent from 2014 highs as is Growlife Inc (OTCQB:PHOT). Advanced Cannabis Solutions became General Cannabis Corp (OTCQX:CANN) but the name change hasn’t stopped it trading down 90 percent from 2014 highs. Petrotech Oil and Gas Inc (PTOG, which at the height of the US pot stock bubble decided to enter the Marijuana space) is down over 99 percent. Another name being pumped at the time was Medbox Inc (formerly MDBX), on January 2016, Medbox Inc (MDBX) changed its name to Notis Global Inc (OTCPK:NGBL), shares are currently trading at about $0.0001 down from highs around $100 in January 2013. Solid performance then. MDBX appears to have been an outright fraud for those interested, of course the SEC settled. Now if the valuation of Canadian pot stocks doesn’t deter you, nor the fact that many US pot stocks blew up, I have a few tips which will mostly be useful for newer traders and investors. Don’t put pot stocks in your retirement account. These are not blue chip names with reliable dividends. Be particularly wary of some of the small names in the space, the penny pot stocks and even those in the $100M-$1B range. These smaller players may fail to compete with the larger players in the space who have better economies of scale and greater access to funding (they can issue stock a little easier and are more likely to trick a beverage company into investing in them). If you are thinking about buying and holding a selection of speculative names, consider first how things went for those who bought and held the US pot stocks in 2013/2014. An investor who bought $10,000 of MDBX (now NGBL) at $50 would have… 2 cents left (based on the close of $0.0001 recently). Yep, $0.02. You can’t even get a packet of ramen for $0.02. Good luck putting food on the table if you buy and hold penny pot stocks. The SEC is also seeking to warn investors again about the risk of pot stocks, like it did in 2014. Figure 4: Screen capture of 2018 warning about pot stocks. Source: SEC website. While I don’t view most pot stocks as the most obvious buy and hold opportunity, they do represent a compelling short term trade. 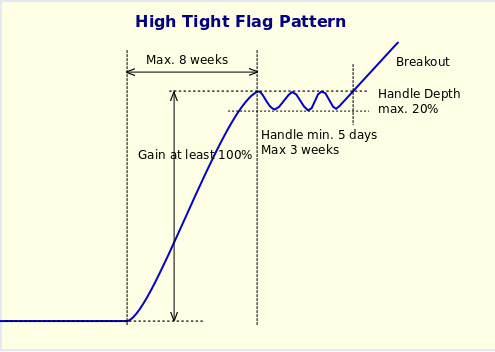 I notice with some pot stocks the formation of a potential high and tight flag (HTF). Figure 5: High and tight flag representation. There are minor differences in the definition of this pattern from one source to the next. Source: Breakoutwatch.com. Renowned chart expert Thomas Bulkowski notes that HTF’s are the best performing chart pattern in bear and bull markets. Table 6: Bulkowski’s notes on high and tight flags. Source: Thepatternsite. I note a HTF formed in CannTrust Holding Inc (OTC:CNTTF) shortly following commencement of trading and an HTF could be setting up again. Others have noted HTF’s seen in TLRY and also CGC. Pot stocks can gap up between sessions leading to large losses for those short. Any trader looking to short these stocks outside of intraday trading should seriously consider hedging their position with options. Not all of these stocks are optionable so that may not be possible in some cases. In the absence of using options, position size has to be considered even more carefully than one normally would. A double overnight is not out of the question and so 1000 shares held short of a $20 stock which pops to $40 would result in a $20,000 loss overnight. In my opinion, consideration of position size alone isn’t enough when dealing with pot stocks, and so without options I wouldn’t be shorting them outside of intraday trading. You don’t want to end up asking for cash via a gofundme campaign because your short blew up your account. 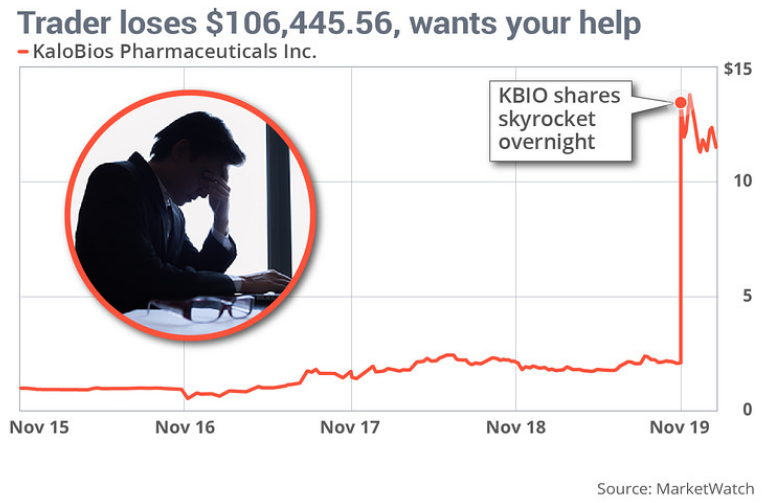 Figure 6: In late 2015 a trader shorted KaloBios Pharmaceuticals and blew up his account due to an unexpected piece of positive news, Martin Shkreli acquired shares and saved the company which was running out of cash. Source: MarketWatch article. You need to assume Canada will become the major player in cannabis production for the whole world to justify current valuations, but does that really make sense? You don’t want to buy and hold pot stocks long term. Take any money you make and get out. Look for a long or a short with help from technical analysis. Don’t short overnight without some sort of insurance.